Jiangsu Hongbao Group is located in the zhangjiagang, which is the land of fish and rice of beautiful and fertile Jiangnan and the national civilized city. It leans against Yangtze River to its north, and adjacent to Shanghai-Nanjing Expressway and Yangtze River highway, having the convenient land and water communication. 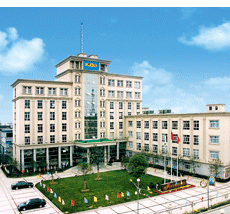 Founded in 1958, the Company is established and developed on the basis of the original Zhangjiagang Second Medical instrument Factory, and developed from an obscure Hand Workshop into a big enterprise group today. Now, we have more than 2000 employees, and the plant covers an area of 600000�O. It is a big enterprise group with the total assets exceeding 3.5 billion Yuan and the annual sales reaching 1.37 billion Yuan. It is one of the biggest tool hardware manufacturing enterprises and important automobile accessory, steel pipe and forging bases in domestic. Now, the Company mainly includes the following enterprises: Jiangsu Hongbao Group Co., Ltd. (Steel Pipe Company), Jiangsu Hongbao Tool Co., Ltd., Jiangsu Hongbao Forging Co., Ltd., Jiangsu Hongbao Photoelectric Technology Co., Ltd., Jiangsu Hongbao Group Import & Export Co., Ltd., Jiangsu Hongbao Furniture Co., Ltd., Jiangsu Hongbao Photovoltaic System Co., Ltd., Jiangsu Hongbao Electronics Co., Ltd., Jiangsu Hongbao Real Estate Co., Ltd. and other units. The main products of the Company include titanium and titanium alloy tubes, bearing tube, Titanium and titanium alloy tubes, composite tube, toolkit, knife scissor, tableware series, home appliances, automobile connecting rod forgings, rail forgings, oil well pipe joint, solar silicon wafer, solar electronic component, photovoltaic power station, real estate and the like. The combination between the products of many brands and the service forges the high-quality and high-grade market reputation of Hongbao Group; and the Company is won the honorary titles of "Jiangsu Famous Brand Product", "Jiangsu famous trademark", "Jiangsu high-tech enterprise" and others successively. We focus on the point that the science and technology production is the first productive force. We have the international specialized production base, efficient enterprise management platform and matched research and development institution around the world and testing center. The member enterprise of the Group has 11 invention patents, 48 utility model patents and 70 appearance patents. A present, Honghao Group is implementing the struggle objective of "create a new Hongbao in five years again". We believe in the enterprise spirit of "Integrity, steadiness, creation and excellence", unswervingly do "Boutique", produce the "New product" and create "famous product", and adhere to the business philosophy of "I create to make you splendid", so as to jointly create the better future with you sincerely!